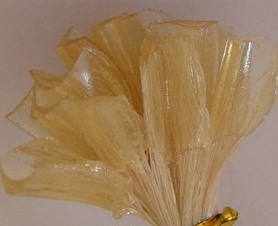 minimum: 1000strands for same length,style and color. production times: 10 days . Pre-glued hair extensions are easy to apply since the glue is already in place. 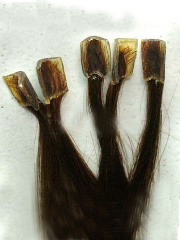 At the end of the hair is a protein tip shaped like a fingertip. You melt the glue with the fusing tool. Save time by not having to do any cutting or weft removing. Shedding is almost eliminated. Glue section is much smaller and lays flatter. Less glue means less breakage and tension. Hair can be reused by removing the pre tipped piece with remover, cut off the glue tip and use your glue gun with adhesive sticks to reapply. 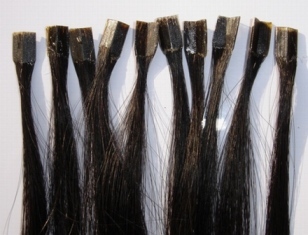 The part of the hair you are adding extension to needs to be free from oils or any slippery coating. We strongly recommend washing clients hair and not adding conditioner before applying extensions. Right 1992-2008 by beauthair.com , All rights reserved.